Virtual reality (VR) is becoming a game changer in the events industry, pre and post event, and one leading events management company is quickly getting onboard. Brand experience agency, The Company We Keep (TCWK), introduced spatial immersive virtual reality to production planning for the events industry – a tool predicted to become an industry standard. TCWK founder, Nigel Ruffell, said the application of virtual reality technology to event planning is relatively new and is a total game changer for the events industry. While VR is widely used in the consumer space and has a broad application across brand activation, it has the capacity to transform the events industry as well. 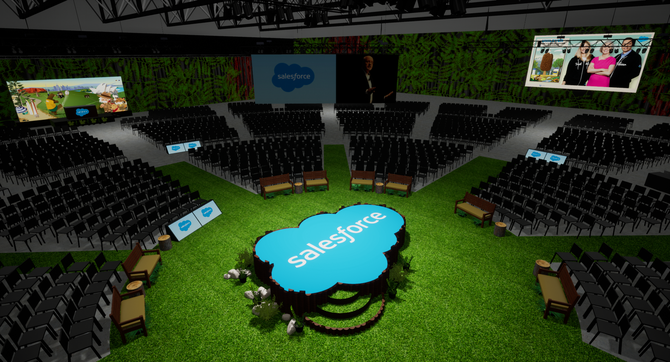 TCWK recently used VR for the Salesforce World Tour in Sydney. This allowed organisers to immerse themselves in the virtual venue to see how things would look to scale, enabling changes to be made before construction. The 185m projection wall Salesforce used on the day was also an Australian-first. “We used VR for Salesforce to visualise the journey before we went on site. We were able to walk through what people were going to experience at the event, before it was built,” Ruffell explained. “This was traditionally done via renders, so clients would go through pages and pages of renders trying to visualise what the final event might look like. “I figured there had to be a better way. So we talked to 7DX, which has this software available that enables us to create our own VR from assets we would already be producing. This saves time and money by preventing a lot of changes." During the Salesforce VR tour, teams could view engaged in places they wanted more signage, see how big the booths were going to be, stand on the stage, and generally get an idea of the whole event before it was built. “While immersed in the event space through the VR technology, brands can see what works and what doesn’t, how signage, screens, decorations, and props look and feel to an audience," Ruffell said. “The biggest problem in event planning is making changes once construction has begun as it is costly, but this technology helps predict those changes. The application of VR to pre-event staging will facilitate the delivery of a high level of complexity and the execution of creative vision, that otherwise would not have been possible." TCWK also used the technology for Telstra this year to demo to customers how processes have changed. "VR is facilitating the gamification of products, and is a fun way of engaging with the brand. We foresee its usage quite heavily in events space going forward,” Ruffell said. Among the product improvements TCWK is planning are animation and video content in its VR walk-throughs, so participants can see the live experience. But while it's definitely added value, Ruffell warned VR is not right for everything. "We don’t bolt it on for the sake of it; it’s just another tool we can include to amplify events, not just in the planning, but also to put people in the experience via VR if they can’t attend an event physically,” he added.